Red and Orange, Green and Blue! 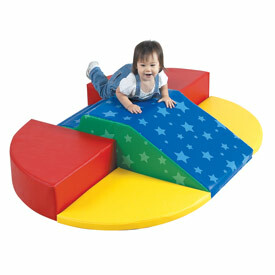 The Rainbow Arch Climber is an all time favorite among parents, teachers, therapists, and most important of all KIDS! 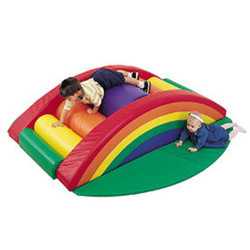 Little children will love climbing up and down the sloping sides of this colorful rainbow, as they look for that elusive pot of gold! Nine geometric foam shapes hook 'n loop together to form this roller coaster of safe play! Watch them climb, roll, slide and tumble, all while developing their gross motor skills. Each foam shape is covered in a cushy vinyl and has Velcro attachments to prevent separation or sliding apart. Optional set of two safety mats. So much fun! My kids are crazy over it! It keeps them active, happy, and occupied.